The effort to purchase and protect Moultonborough Falls Conservation Area was managed by the Moultonborough Conservation Commission and led by a committee of local conservation minded volunteers. The project to save Lee’s Pond Preserve started in 2014, when a real-estate agent for the property owner presented the land to the Conservation Commission. Over the course of several years, a core team of people that are interested in permanently saving the land, formed a committee that is working through the details of the easement, stewardship and finances. Now that the property is purchased, we need volunteers with skills in building trails and kiosks. 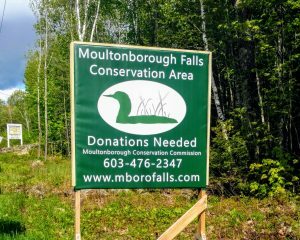 Contact the Moultonborough Falls Conservation Area fund raising committee by calling the town hall at (603) 476-2347, during business hours, and ask about the property. You will be connected with a member of the fund raising committee.